Tirukoshtiyur is about 10km from Tirupattur. The place where Ramanujar broadcast Ashtaksharam for the benefit of mankind. There are four Perumals at four levels - at ground level - Krishnan (Koothadiya kolam), first floor- Sowmyanarayanan (Kidantha kolam), Ninra Perumal at third level & Paramapada Nathan (amarntha kolam) at fourth level). It is from the fourth level of the Ashtanga Vimanam, Ramanujar announced for the world the Ashtaksharam. 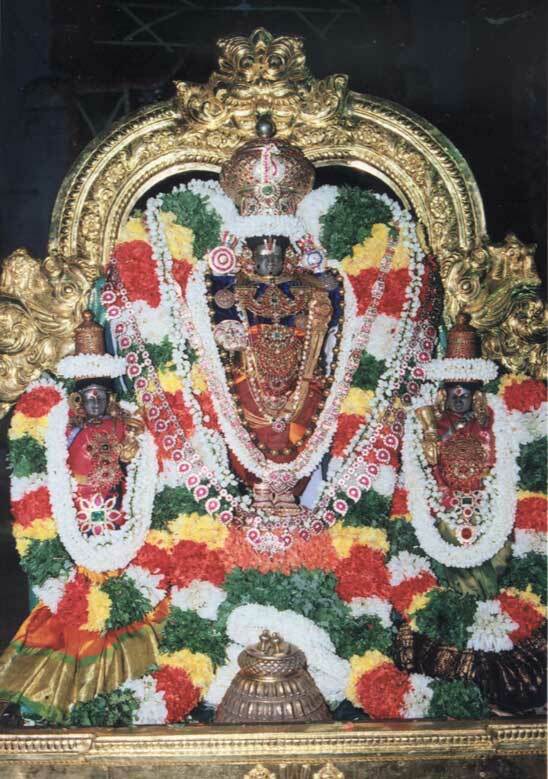 This sthalam is one of the divya desam found in Thiruppathoor taluk Ramanathapuram district in Tamil Nadu. 7 miles away from Thiruppathoor, which is found nearer to Melloor and around 70 miles away from Madurai. We can go to this sthalam from Karaikudi also. Lots of bus facility is available. In this sthalam, a Kadambha Maharishi had a big Ashram, where lots of vedas and spiritual teachings are taught and the rishis and the people around the Ashram lived in peace. At that time, an Asuran by named "Hiranyan" gave lots of problems to rishis, devas and all the other people and all of them wanted to find a safest place. They could not protest Hiranyan, since he was very strong and has got lots of soliders, so, the rishis yogis and the Devas thought it is safe to get on to an unreachable place. Thinking Kadambha Maharishi's Ashram might be the safest place, they all seeked the help of Sriman Narayanan to kill him there by retaining the peace, once again. Sriman Narayanan, Lord Brahma all the devas and along with the rishis, discussed about the killing of the Asuran, Hiranyan. And finally after the discussion, Sriman Narayanan decided to the Narahimha avathaar, whose head being the head of the lion and rest of the body as an ordinary human. Since, Hiranyan had got the Varam in such a way that he should not be killed by an ordinary human, Sriman Narayanan has to take this avathaar to destroy and kill him. Since, all the rishis, devas and along with Sriman Narayanan and Lord Brahma met all at one place and discussed, this sthalam is called as "Goshtiyoor". Goshti means all the devas along with Sriman Naryanan grouped together and met in this, sthalam this sthalam is called as "Goshtiyoor" (or) Goshti Kshetram. Kadambha Maharishi had an unlimited bhakti towards both Emperumaan, Sriman Narayanan and as well as Lord Shivan. In thirukkarambanoor, he did the tapas towards the Emperumaan and in Nagapattnam, towards Lord Shiva and got his Mukti, worshipped all the Mum - Moorthies in this sthalam. When knowing about the sthalapuranam of Thirugoshtiyoor, an another peculiar issue has to be explained which deals with he story of Sri Ramanujar and Thirugostiyoor Nambi. Thriugostiyoor is the birth place of Thirugostiyoor Nambi, who is also named as "Selva Nambi". He was the guru of Sri Ramanujar, who was preached with the "Ashtakshara Mantram". But, the way he was taught the Ashtakshara Mantram was one of main issue that has to be explained. 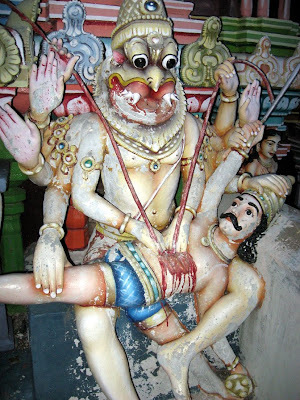 Selva Nambi ordered Sri Ramanujar to do the fasting in this sthalam. Having crossed the age of 60, to get the Mantram, he followed the order of Selva Nambi. He took only water as his food and one fine day, he was preached witht he Ashtakshara Mantram for which he was waiting for. But, he was ordered by Selva Nambi that the Mantram should not be published to any one and it should be kept secret. But on hearing the Mantram, he thought it is not only a secret thing that is helpful and useful for him only, but it should be made public to all and it should be useful for all the other people. 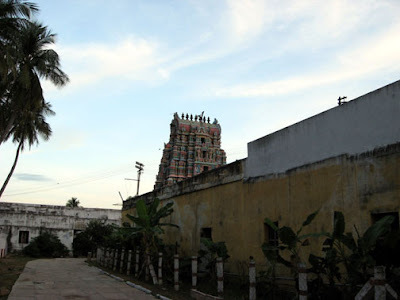 As a result of his thought, he went straight to the temple of Sowmya Narayana perumal and stood on the huge walls of it and all of the village people to gather. And once all the people gathered, he loudly pronounced the Ashtakshara Mantram, which is said to sacred and explained it to all. He also asked them to repeat it. On hearing this, Selva Nambi got angry on Sri Ramanujar since he has not obeyed his words and has broken the promise that he had given to him. Then, he called up Sri Ramanujar and said that having broken the promise, he will have to pay for the mistake, and as a result, he will be going to the hell. But before that, Thirugoshtiyoor Nambi (Selva Nambi) wanted to know the reason why he made the Ashtakshara Mantram so public? But, Sri Ramanujar aswered that in this world, all the things belongs to Sriman Naryanan and no other thing should be kept scret (or) themselves but it should be used to others. As the same way, on explaining the Mantram to all, it might help them from many things and because of this reason only, he answered that he publicised the Mantram. On hearing this from Sri Ramanujar, Selva Nambi realised how his mind was narrowed and felt for it. But, at the same time he was attracted by the thinking of Sri Ramanujar towards humanity and vaishnavism. As a result of it, Selva Nambi called Sri Ramanujar as his Emperumaanar. We can find two separate statues that is made of bronze for Thirugoshtiyoor Nambi and Sri Ramanujar in this temple. On reaching the temple, one can see the Vimaanam which is very big and widely spread. 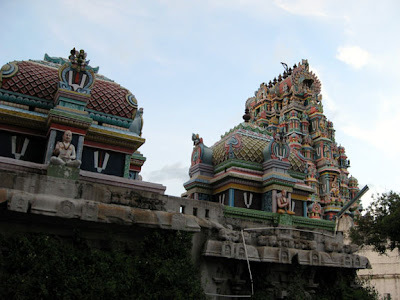 On entering the temple is the mandapam named "Thirumaamani Mandapam", where Lord Shiva gives his seva as "Sarabeshwarar". He originated on his own (Suyambhu) and as a result of not caring properly, it was in the damaged condition. On the south direction of the Mandapam, a separate sannadhi for Lord Narasimhar and on the North side, a separate sannadhi for Sri Ramar are found. It is said that in front of this Narasimhar sannadhi only, Sri Ramanujar was taught the "Ashtakshara Mantram" from selva Nambi. 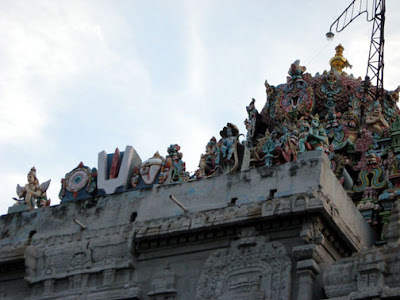 In the upper tier, we can find Moolavar, "Thiru paarkadal Nathan" also named as "Uraga Mellanayaan" (or) Sthiti Narayanan is found in Veetrirundha thirukkolam and on the either side of him is periya and Bhoomi piratti are found. It is said that utsavar, Sowmya Narayana perumal and other 3 pirattiyaar's idols are given by Indiran to Kadambha Maharishi. On the south side of Ashtanga vimaanam, a separate sannadhi for Thirumaa magal Naachiyaar and on the North side, there is a separate sannadhi for Sri Aandal is found. In the middle thalam (or) tier, we can see Nindra Narayanan along with Periya piratti and Bhoomi piratti in Nindra Kolam and he is also named as "Upendran". Here, we can find lots of various architectural works pertaining to the Indra Loka scenes and saptha rishis. Lots of Painting and artistic works like Desavathaaram, devas, Munis and suriyan and Alwars are found. On the outer pragaram on the North side, there are two sculptures of Narasimhar is found, which explains the Hiranya Vadham (Killing of Hiranyan). But, initially one of the statue is kept in Narasimhar sannadhi in the first tier and another one is Sri Ramar Sannadhi. But, it is said that on seeing the statues of Ugraha Narasimhar, people are frightened, so later these two statues are kept close to the paramapadha vaasal (entrance). 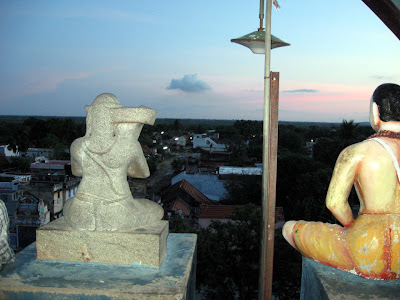 Udayavar, Emperumaanar Sri Ramanujar statue is found on the top of the Vimaanam facing the village and this sthalam is so called as "Dhvayam (two) vilaindha thirupadhi". This sthalam explains all the necessary actions (or) moral to the people of the world. No one can destroy the enemy as a single person, but if as a team, we can achieve anything and it is well explained by the action performed by Sriman Narayanan to get the divine nector for the devas. And another incident is the action performed by Sri Ramanujar by explaining the Ashtakshara Mantram to the world. As an extension of this, Udayavr Sri Ramanujar who is the hamsam of Aadhiseshan, is serving as the bed for the Emperumaan. The Moolavar of this sthalam is Sri Uraga Mellanayaan. He gave his prathyaksham for Kadambha Maharishi and Indiran. Moolavar in kidantha (sleeping) thirukkolam and in Bhujanga sayanam facing his thirumugham along the east direction. The thaayar of the sthalam is Thirumagal Naachiyaar and has her own separate sannadhi. 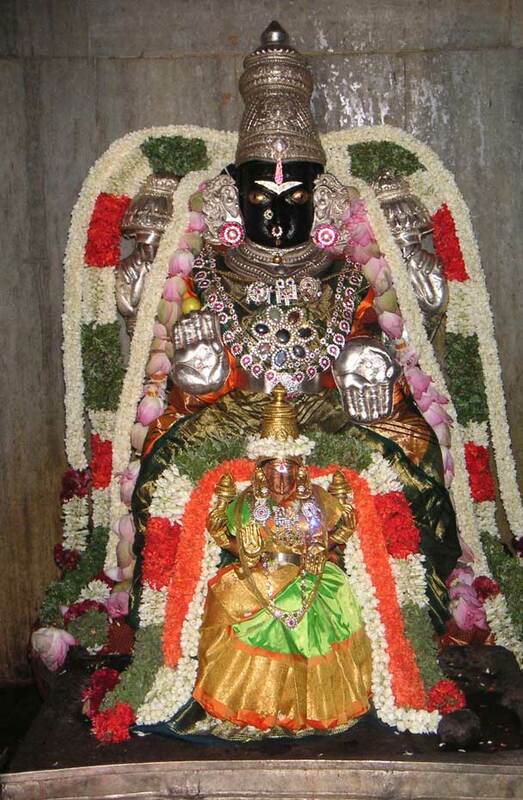 The Utsavar of this temple is Sri Sowmya Narayana Perumal and he is also named as "Madhavan". Utsavar is found in Nindra thirukkolam and giving his seva to the bhaktas. Pin: 630210. Tel: 04577 - 261122 or 261103. 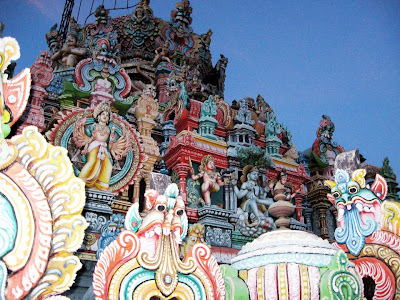 I recently called the Temple to find out about the Sarabeshwarar Pooja in this temple. Seems to be that the Temple people are not aware about Sarabeshwarar being here. There is no sannidhi or mandappam of that sort. If Sarabeshwarar was present it is very auspicious but does n't seem to exist. Either this info is wrong or the people at temple are wrong. Can anyone else confirm the same? Sorry, This is not Sarabeshwarar Temple. 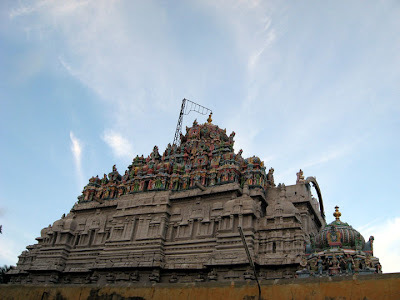 Sarabeshwarar Temple is located in Thirubhuvanam which is around 10Kms from Kumbakonam. Temple Phone Number : 0435 2460760.